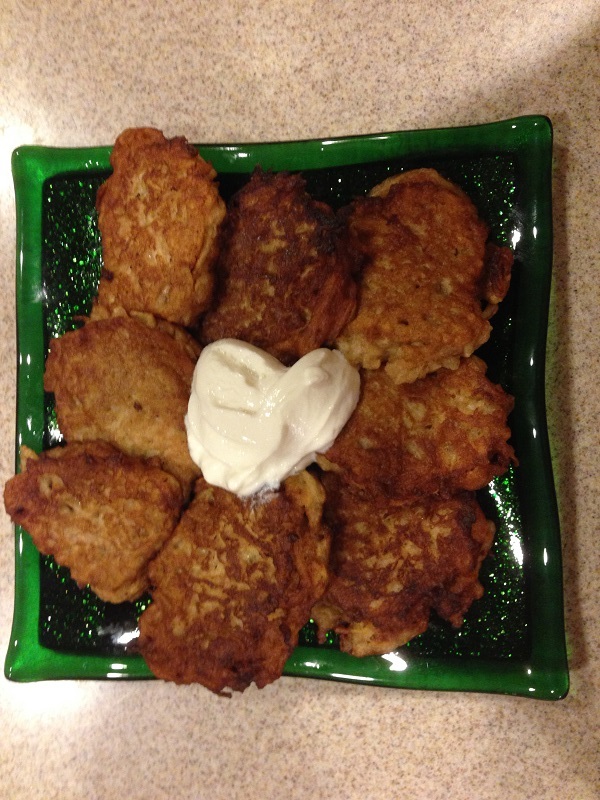 This is great recipe for Chanukah and a nice change from potato latkes! You can serve them as a side dish or as a dessert. Whenever I’ve made this dish I’ve gotten rave reviews and requests for the recipe. This makes quite a large amount, so if you’re serving just a few people you can halve the recipe. Use a food processor, if you have one, to chop the apples. Beat eggs until light and foamy. Mix in 3 Tbs. sugar, salt, 1 tsp. cinnamon and water and blend well. Stir in the chopped apple, four and lemon peel. Mix well. Cover the bottom of a skillet with ¼-inch of oil and heat. Use about ¼-cup of the batter for each latke. Drop into the hot oil and flatten slightly. Fry until golden brown on both sides, and drain on paper towels or brown paper. Add oil to the skillet as needed. Combine the ¼ cup sugar and remaining 1 tsp. cinnamon and sprinkle over the hot latkes.